For some reason I have had this song stuck in my head the past couple of weeks. Maybe it was something I read, or maybe it=s that time of year. Time to put the cold dark months of winter behind us and start thinking about all those beautiful flowers and veggies that will adorn our gardens for the next several months and well into fall. It=s time for myself and many others to start those many seeds that we either saved from last year's crops, bought online or in-store, or that were passed on from friends. It=s not hard or very time consuming. A little goes a long way and the diversity is endless. One of the best parts of my Spring is seeing the first seedlings popping out of the soil, reaching for the sky, (albeit through my picture window for the first few weeks). I always start too many, but that is part of the fun. You aren't limited to your choices and sharing the bounty with family and friend is always a bonus. Flower, fruit, or vegetable? Watching your gardens come to life with plants you nurtured from seed is well worth the effort. If you need some tips check out our gardening section at your local library, that=s 635 in the non-fiction section. 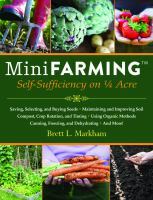 You=ll find plenty of great books with lots of helpful tips, like this one: Mini farming : self-sufficiency on a 1/4acre by Brett Markham, or Seed Sowing and Saving by Carole Turner. Do a search for "gardening" on our catalog online for plenty of great books! I=ve been going through my seed packets and planning this year's crops. Happy gardening!! I CAN=T WAIT!! GONNA GET MY HANDS DIRTY!! Tim Jackson has been starting and sharing plants for more than 20 years. He works in Technical Services here at Library Headquarters. We are surrounded by an avalanche of information when it comes to our health. Naturally we want to be able to find out about our symptoms or conditions on our own time and there are plenty of tools out there for us to use. The library hosts a health and wellness database, and Nova Scotia has a dedicated health line (just dial 811 and you can speak to a registered nurse); and of course there is always the Internet waiting for your question. The Internet is often the route that most people take. If you want to do your own research and want to be sure about the quality of their information, here is a little tip. There is a Non-Governmental Organization dedicated to the provision of quality health information. It is called the Health on the Net Foundation . They provide certification using the HONcode symbol to websites that meet and follow a specified code of conduct with regards to health information. When you are surfing the internet and see that symbol on the webpage you will immediately know that certain evaluation criteria were met. This means you don't have to spend extra time investigating the credentials of each website yourself. Another shortcut that is offered is the HONcode search page which will search your terms and only retrieve information from HONcode certified sites. This narrows your results eliminating a lot of searching on your part. This is not to say that there is not good information on other sites that did not seek certification only that the sites retrieved did. You will find that most well known health sites have this symbol on their page. It is important that when you are looking into any medical problem you get current and reliable information. We want to help you find it whether you use our databases or investigate on your own. Hopefully this tip will help provide you with the right information before your next visit to your health care provider. 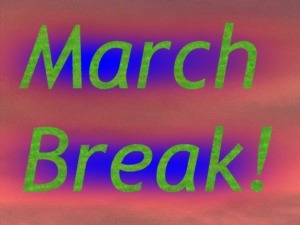 March Break at the library! You may not be heading south to warm sand and beaches. That's ok, because you can have a whole lot of fun right here in the Valley! And thanks to your local library, you can have that fun for free! Our libraries have put together a great line up of programs and activities for all ages during this March Break. Perhaps your teenager is moaning about nothing to do. Nip that in the bud by sending them over to the Bridgetown, Berwick, or Lawrencetown Library to learn West African Drumming with Kadijah. Or drop them off in Kingston on Tuesday for some Duct Tape Crafts. They can learn to draw with Mark Oakley, play board games, create a zine, or learn web design. Click here for these and other great activities! We've got plenty of other things lined up, too. Build with LEGO in Berwick, Bridgetown, Lawrencetown, Kentville, and Windsor. Have some Wimpy Kid fun in Kingston. Port Williams has craft days, as do Annapolis Royal, Berwick, Middleton, and Kentville. There are free computer workshops, too. So, if you hear this refrain "There's nothing to do! ", just check out our website, and get them over to the library for some excellent March Break fun! Of course, you could always read a few books this week, too. Or try an audio for a long car trip. Borrow a new game for Wii or xBox. We've got this March Break thing covered. Where have all our copies gone? Does someone you know have a long overdue library copy of the book On South Mountain, by David Cruise? Do you? HELP!! Over the years, almost all of the library's copies of On South Mountain have disappeared! They weren't stolen, exactly. They were legitimately signed out from the library, but then never returned. Patrons have moved and contact information is outdated. Please help us -- we need them back. The book is no longer in print, and with the publication of the new book Our Daily Bread by Lauren Davis, there is renewed interest in this dark chapter of Annapolis Valley's past. If you are in possession of one of these books, please return it to us. If an acquaintance/friend of yours has it, please implore him/her to slide it in the outside book return slot of one of our libraries some night.